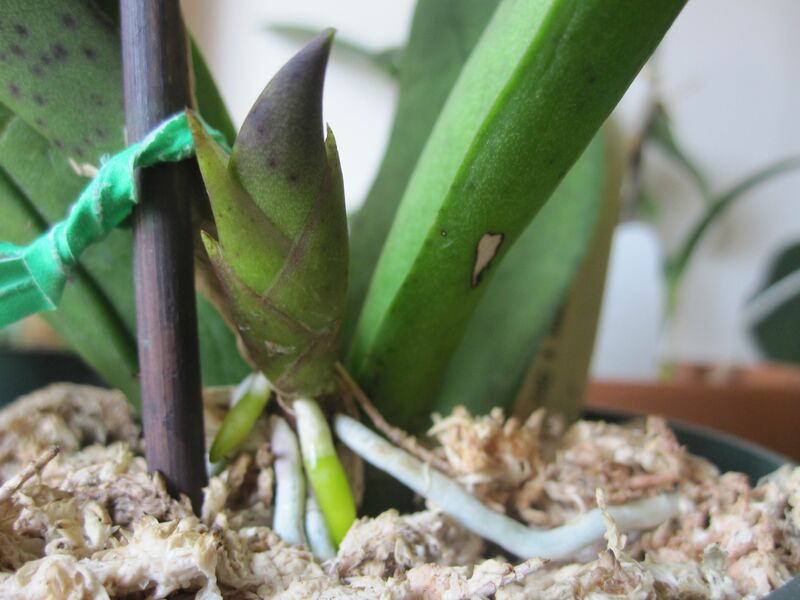 I have a bunch of good news about my orchids and one bit of bad news, so I’ll start with the bad news first: I lost my Paphiopedilum Wizard of Oz ‘Hausermann’s Toto’ AM/AOS x [Paph. Candy Apple x Paph. Pulsar]. 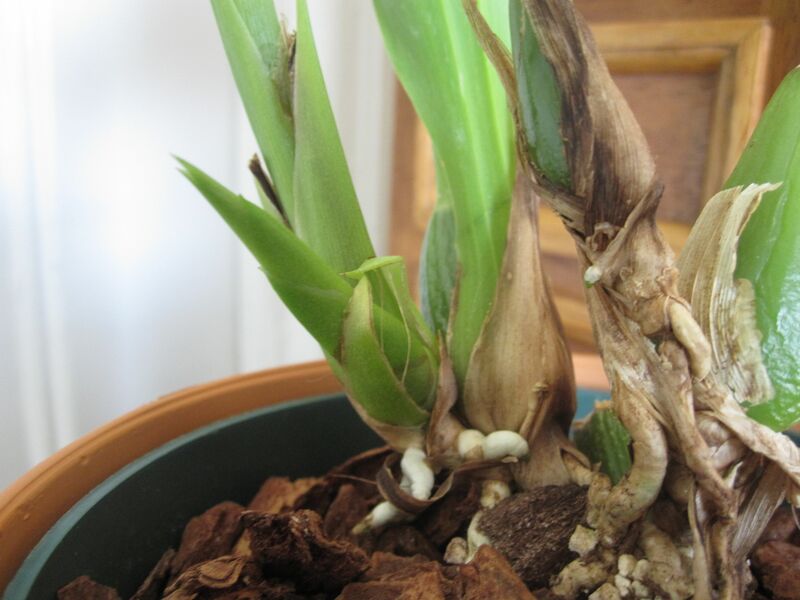 It had been doing very poorly for quite some time, and just didn’t seem to want to recover, so two weeks ago I sent it to the great orchid farm in the sky. 🙁 Orchid kill count: eight (I think??). Obviously this Dend. 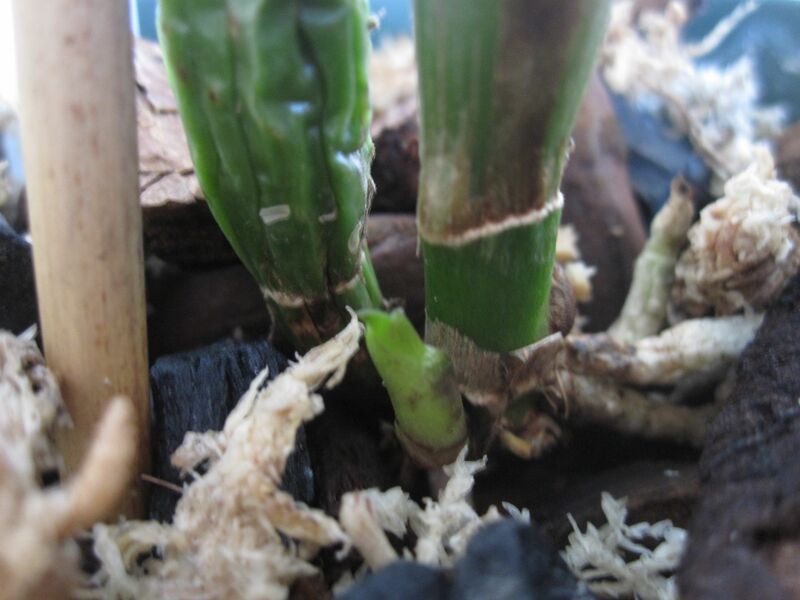 is lacking healthy roots, but I’m happy to see that it’s in good enough shape to start putting out a couple new growths! There’s the purple one in this photo and there’s a slightly larger growth on the other side of the plant (not visible in the photo). 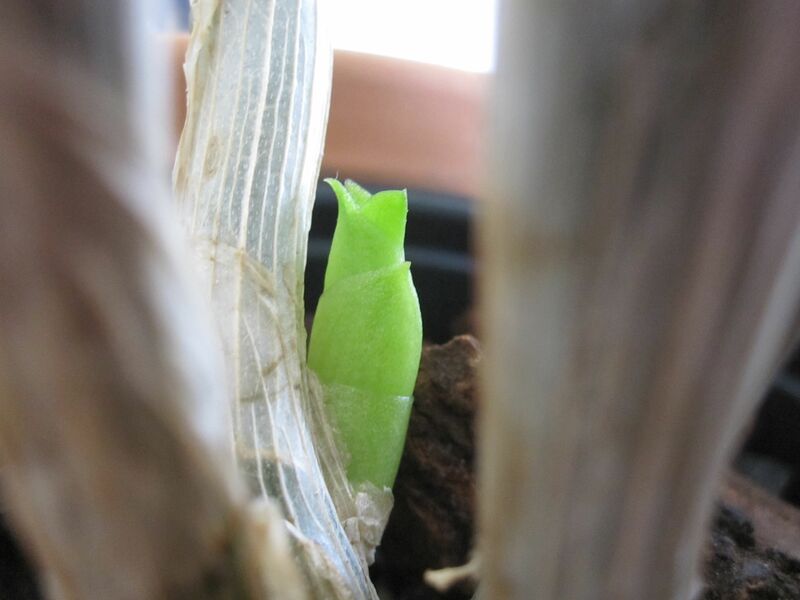 I can’t tell if those little growths are keikis, side shoots, or just some random vegetal sprout. 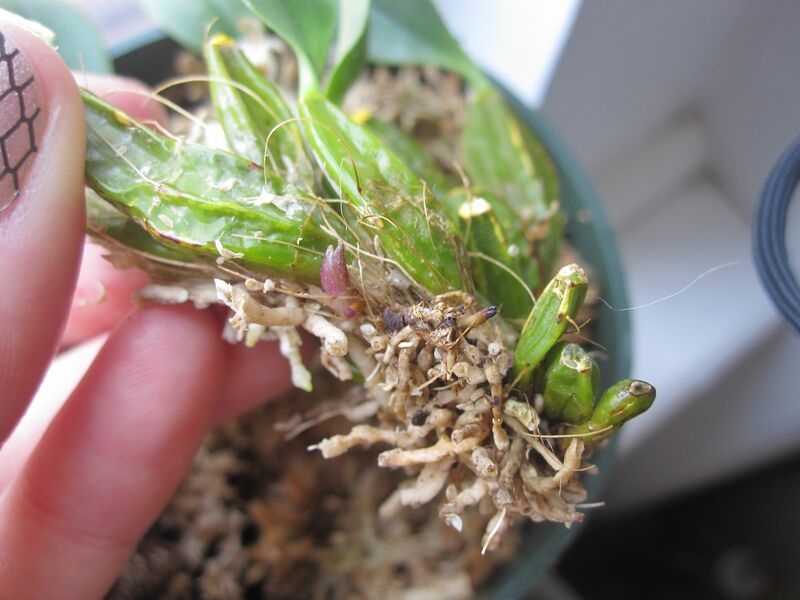 I’ll continue to update here on my blog as these orchids react to the hormones in the Keiki Grow Paste! 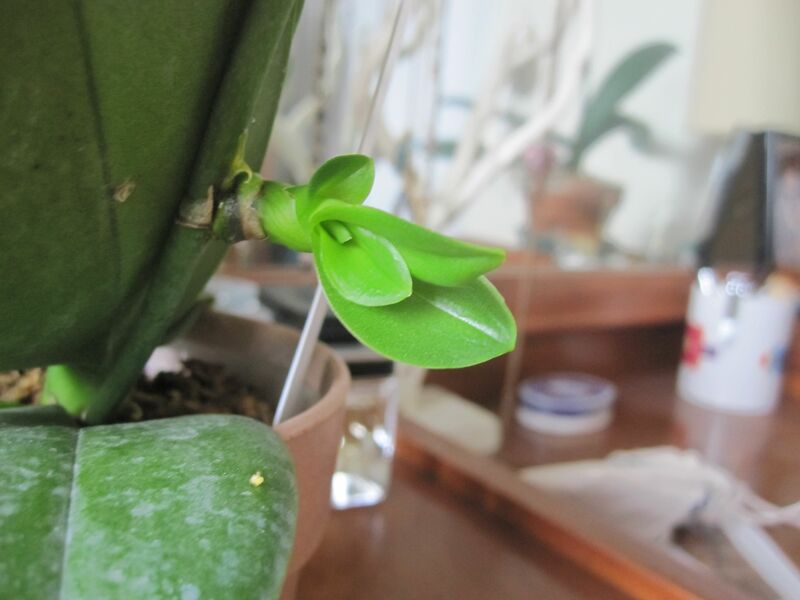 Only two of my orchids (Phals) are in bloom right now—three Phals dropped their blooms in the past week. They had been in bloom for about three months, though, so they had a good run. I moved a few of my Phals to a shelf out in the apartment hallway, because there is a skylight out there and the area gets nice bright light. I’m curious to see how well they do out there, but I may need to bring them back into the apartment when it gets really hot outside because the hallway can get flaming and stuffy as all hell. Hope everyone had a lovely long weekend filled with BBQs, swimming, and relaxation! 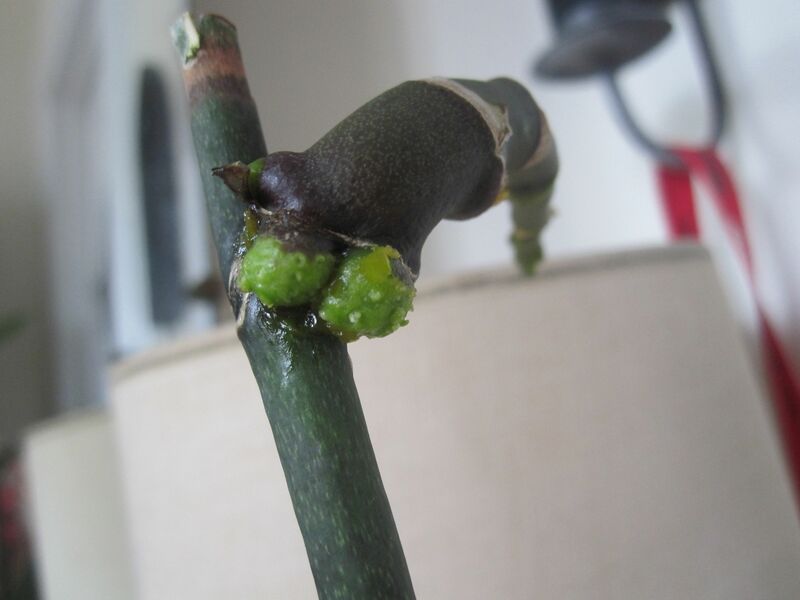 Looks like you are on a roll with new growth. Not long before more bloomiing should come. That is some funky odd growth, wow!! I know, right?! I can’t wait to see how many of these actually turn into keikis. Not yet, but they are still growing. I was just thinking the other day that I need to do another update soon! 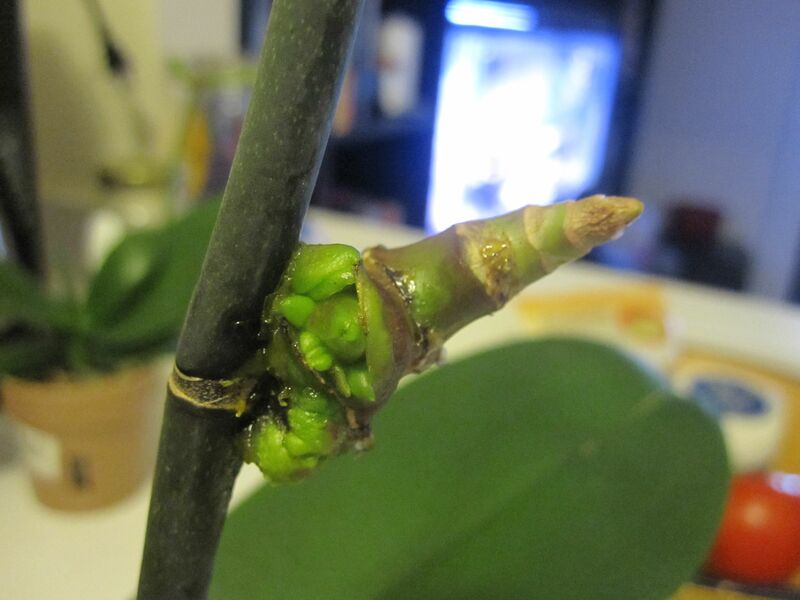 Whenever I put orchid keiki paste on my phals they doesn’t do anything, they doesn’t grow keiki, they just grow insanely big and fat flower spikes! 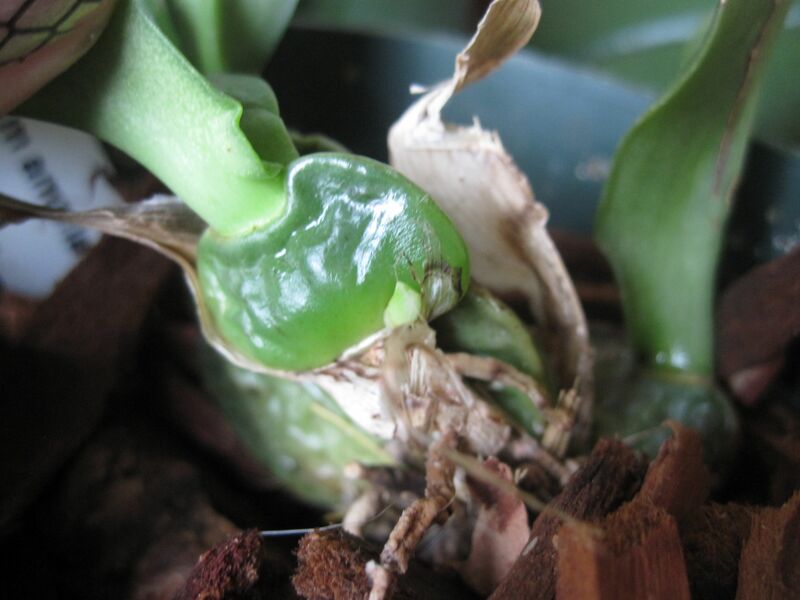 I have 23 phals 3 cattleys and 1 dendrobium, all got a porsion of keiki paste on the flower spikes nodes, EVEN ONE ORCHID DIDN’T GROW FOR ME A KEIKI, ALL GOT THESE ODD FAT SHORT FLOWER SPIKES THAT JUST DON’T WANT TO BLOOM! WHAT SHOULD I DO!?!?!?!?!?!?!? Hi there – it’s hard to say why the keiki grow paste isn’t working for you. Perhaps your paste is past its prime? The paste isn’t guaranteed to produce keikis, but I’d imagine with that many orchids you’d get at least a couple of them out of it. Here’s my blog post about how to apply the paste – maybe you haven’t put it on the right spot? Sorry that I don’t really have any answers for you!